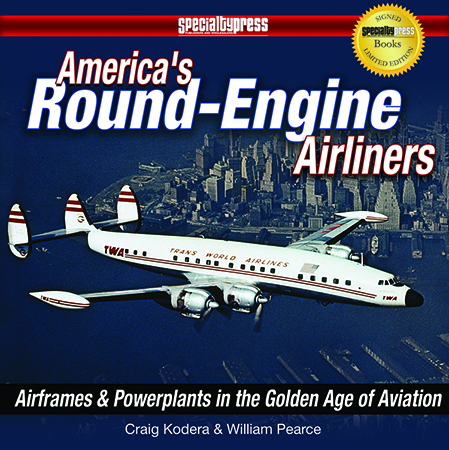 Round in cross-section, reliable, reciprocating radial engines literally propelled American air travel from frail, fabric-and-wood airframes to fast, safe, all-metal designs – cementing U.S. leadership in the field. That's the premise of America's Round-Engine Airliners from Specialty Press. Call this compendium "multi-dimensional": part aerodynamic, part engineering, part technical, part mechanical, even part cultural – but all informative and entirely entertaining. Each chapter divides into Kodera's "Getting There By Air" and Pearce's "Hardware on the Wing" sections. You'll easily see why. Hundreds of illustrations – color and B&W shots, archival images, drawings, close-ups, exploded views, memorabilia, and more – season the saga. Sidebars and explanatory captions further complement commentary. And a selected bibliography and index complete contents. It's full of fascinating facts, too. Thanks to revolutionary American designs like Douglas' DC-3, for instance, total U.S. airline passengers "increased nearly ninefold, to more than 4 million" between 1934 and 1940 – just six years. Kodera and Pearce's splendid study nicely surveys the maturation of American commercial flight. And it's a cool, colorful introduction to the roots of today's international air-transportation system. But were engine nacelles really "rather perpendicular to the swept leading edge" of the DC-4E wing? With thanks to Specialty Press for the review copy.